Growing up with an art-studio in my house—surrounded by paints, brushes, fabric, thread, clay and wool—learning to express my love for the world through images and colors came naturally. 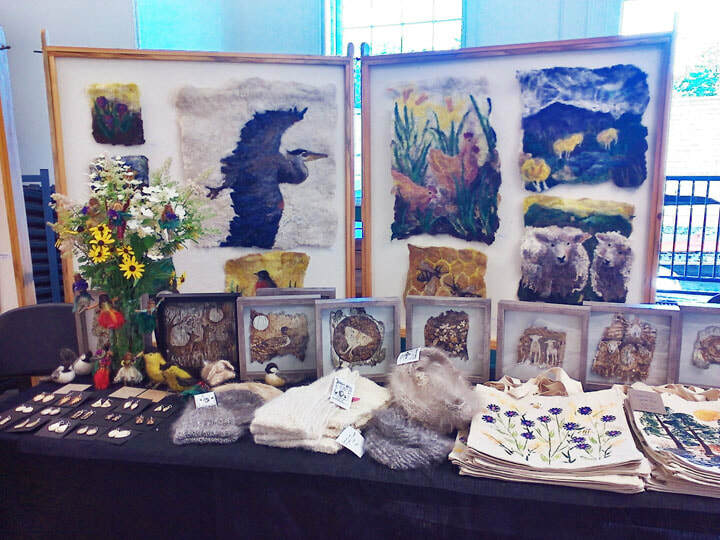 My birch bark pyrography and felted pictures are highlighted here, because I've made these most recently. I gather inspiration from the outdoors: colors, patterns and shapes of animals and landscapes. I love the act of transformation in art, of simply taking something, and making it into something else. In this age of so much plastic, I find that I'm attracted to working with natural materials. I've always loved birch bark and fiber. As a young girl I spent so many hours outside playing and building fairy houses, and now I get the same kind of joy from working with bark, angora and wool! I owe so much to the natural colors and beauty and texture of the bark. I like to think about what a tree has witnessed, and finding images that feel like they belong on the bark. I am happiest when I work with my hands.